Brighter Green and Lantern Books co-hosted a discussion on the future of conservation in Central and East Africa on Tuesday, November 17 in Brooklyn, NY. The three speakers had just arrived from Kenya the night before: Josphat Ngonyo, founder and director of the Nairobi-based Africa Network for Animal Welfare [ANAW], who has more than 15 years of experience in ‪‎wildlife‬ ‪conservation‬; Ambassador Nehemiah Rotich, chair of ANAW’s board of directors and former head of the Kenya Wildlife Service and chair of the National Task Force on Wildlife Crime, and Kahindi Lekalhaile, a wildlife scientist also working with ANAW. Jean Kim Chaix, director of the Virunga Fund, who’d planned to speak but was unable to since he was still in DR Congo, where Virunga National Park is located. Josphat, Amb. 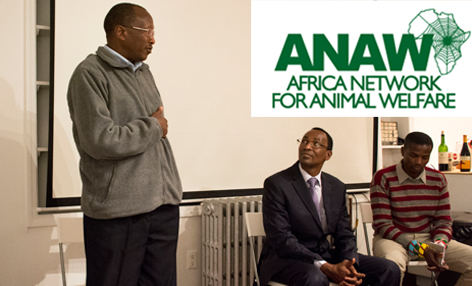 Rotich, and Kahindi spoke about the history of ANAW, its current work on both ‪animal welfare‬ and conservation issues (spanning humane education, ‪‎anti-vivisection‬, and ‪factory farming‬) and their efforts to protect wildlife and get local people involved in conservation — and ensure they receive its benefits. Amb. Rotich remembered working with Kenyan Nobel peace laureate Wangari Maathai and how she would hug trees to prevent bulldozers from destroying them. He also recalled how over thirty years ago, newspapers would not cover the topics of wildlife or the environment, but how this has changed. He urged those attending that “we need to work together,” whether it is to help protect trees, wild animals, or domestic animals. The speakers also underlined that when animal welfare is improved, ‪human welfare‬ is improved and that this is a message they hope more people will come to understand in Kenya and elsewhere. Kahindi also discussed the concept of “animal freedom” and ANAW’s work to expand this experience of freedom that, he said, all non-human animals share and desire, whether domestic or wild. Those in attendance had the chance to ask a few questions. One person wanted to know how local people could be incentivized to protect wildlife. Josphat mentioned that local people need to learn the intrinsic value of wildlife (through education) and how it’s to their benefit to conserve these animals. The speakers also spoke about the colonialist history of national parks and reserves. Since Kenyans generally oppose the government, they are skeptical of government-sponsored wildlife protection programs and generally resist them. In the past, the government has never given the local community the opportunity for ownership and responsibility of these protected lands. Therefore, a popular alternative would be to build more community-supported conservancies, rather than state-sponsored parks. One of the last questions asked was about the issue of food security and the problem posed by increased meat consumption. Companies have been taking advantage of increased food demand by promoting a shift towards more intensive farming (similar to factory farming). However, Kahindi stressed that Kenya has enough food, but the issue is distribution, unrelated to quantity. Lastly, even though there are many advantages to having a plant-based diet, there is a long association of meat with wealth, which makes many hesitant to make this shift. Afterwards, Brighter Green’s Emily Lavieri-Scull asked each guest some related questions (submitted by followers of our What’s For Dinner?-themed WeChat group in China). VIDEO COMING SOON.